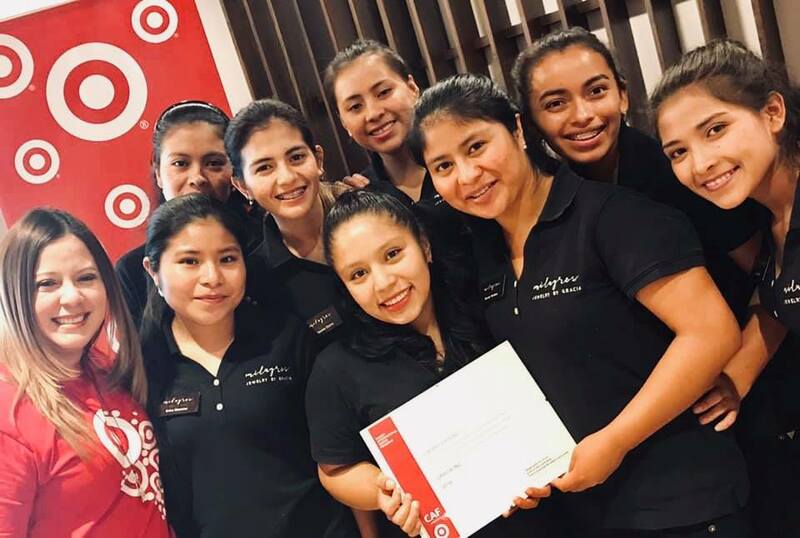 Gracia Receives Award from Target Corporation - Gracia, Inc.
Last week, Gracia’s Mujeres Fuertes took the bus from Jalapa to Guatemala City to receive recognition from the Target Corporation for demonstrating their remarkable leadership and business management skills. Gracia was awarded a generous grant from the Target for its work to economically empower young women in rural Guatemala. Las Mujeres were first introduced to Target-Guatemala at the New World Craft Show in Antigua, Guatemala. Target’s representatives were drawn to the Milagros booth by our products. As they learned about the Gracia Entrepreneur Training program, they became impressed by the holistic approach Gracia takes to educating young women. They invited Gracia to apply for one of their grants. The Target Foundation grant process is by “invitation-only”. So, we were honored to have received grants from them in both 2017 and 2018. Establishing a business connection within Guatemala is both a goal for Gracia and its young women. This is another strong step in Las Mujeres Fuertes professional careers as they build relationships and tap into resources outside the remote area of Jalapa. Many thanks to Target, and especially, to its Guatemala City office. We’re grateful for your continued support! Awesome. Congratulations to all! This is the type of recognition and connection everyone has been aiming for since the program began. Thank you, Paula. We are always grateful for your support and insight. So glad you’re on Team Gracia! These ladies are indeed a true inspiration to me, meeting Gracia leadership and team has been one of the most rewarding experiences in my life, so strong and courageous women that want to change the world starting with themselves. I am thankful for the opportunity to meet them in person, God Bless you always. Thank you, Susana. So glad we met you at New World Craft Show! Your help has been a game-changer for Gracia and our Mujeres Fuertes! Thank you, Stephanie. We are so glad to have your interest and support! Thanks for all and more to come!